familiar site in the Tuscan countryside. When traveling, the experience of sights, sounds, smells, accommodations and of course the cuisine are the things that make a trip memorial and worth repeating. The pleasures of traveling in Tuscany definitely fall in the "worth repeating" category. Warm peaceful days with languid skies and scented breezes wafting over olive groves, fields of sunflowers and grape vineyards provide a setting that is very hard to duplicate. Some of the best memories are the sumptuous meals and wines that abound throughout the region. The locals all have their favorite wines and places to dine and we tried many of their recommendations. We also dined at several roadside “restorante’s” and we were not disappointed with any of them. Naturally, there were some exceptional dining experiences that we will touch on later in the article. A trip to Tuscany can be greatly enhanced by reading Frances Mayes Under the Tuscan Sun and also some of the many writings on the Medici family that can be found in your local library. Frances Mayes puts you in the proper mood to really enjoy what Tuscany has to offer and provides much helpful information as well. We didn’t read Frances Mayes second book, Bella Tuscany, but did have available a well written article based on an adaptation of the book, from the National Geographic Traveler. Also, Fodor’s has many guidebooks including one on Tuscany that we recommend. Traveling in Tuscany from our perspective is best by private automobile. The roads are generally in good condition, although considerably more narrow than Americans are accustomed too. Also, for the adventurous there are many less well-marked by-ways that lead to interesting and unusual places. Our approach was to have one person as the driver and another acting as the navigator. Some might like to switch off, but we found that by staying with the same driver and navigator throughout our stay each acquired a very workable knowledge of the roads and signs. Our navigator, John Hayes, did an absolutely superb job in getting us to where we wanted to go and also to some really out of the way places that only the locals know about. His navigation skills allowed us to travel on some roads that the less adventurous would not attempt. We arrived in Tuscany after spending 10 days in France and 4 days in Venice. As a result, we were well acclimated to the time change and had been driving in Europe most of the time. We departed Venice mid-morning in a rental car, with an objective to arrive at our Villa by late afternoon. The major highways are much the same as the freeways in America after you adjust to the speed, signs and spelling in Italian. We recommend that you have good maps, including the Michelin 429 and 430 as well as maps of any cities that you plan to visit. We also had a map of Chianti that had been provided by a friend from Florence which we would like to have duplicated, but could not find even at the tourist bureaus. From Venice (Venezia) we followed the A-4 to Padova, then the A-13 to Bologna. There we picked up the A-1 to Florence (Frienze) and beyond to Valdarno. Once past Florence, we were entering Chianti country with many fields of sunflowers as well as olive groves and vineyards. We exited the motorway A-1 at Valdarno and took 408 toward Siena. The traffic was relatively light, by Italian standards, as it was a Saturday morning. The roadside rest areas were busy and offered a variety of services including fuel, ATM, restrooms and a well stocked small grocery store. Throughout Italy, the restrooms require payment for use by the ladies and often for the men. Generally it is .50 Euro so it is a good idea to keep a good supply of Euro coins on hand for this purpose. Also, the restrooms are staffed, which assures in most cases cleanliness, so tipping is expected. The dollar goes a long way in Italy; so being generous was our motto with regard to all service people. Our destination “Villa La Selva” is near Montebenichi in the Bucine area. Our route from Valdarno continued through wine, olive and sunflower country and passed through Levane, Bucine and Ambra before arriving at Villa La Selva. On the way, we stopped in Bucine to visit the local grocery store and pick up some supplies. The store was well stocked with the items we desired including mineral water, paper supplies, wine, breakfast cereals, eggs, bread etc. Including this and other stops, we managed to make the trip from Venice to La Selva in less than seven hours. La Selva, is a large estate dating from the early 1200’s that once belonged to the powerful Medici family. It became the property of the brothers, Riccardo and Sergio Carpini in the 1950’s. Each of the brothers operates separate aspects of this large estate with both offering villas and other accommodations. In addition, wine making in the family dates to 1245 when friar Geovanni Carpini was sent by Pope Innocent IV to the Emperor of Cathay bearing a gift of rare Tuscan grape rootstock. 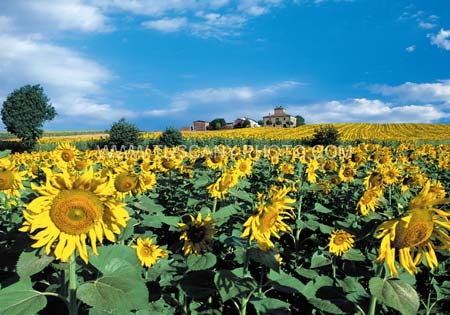 The estate also features vast fields of sunflowers and beautifully maintained olive groves. The villas at La Selva range from a one bedroom honeymoon suite “Libreria” to an eleven bedroom, eleven bath farmhouse “Villa Felciaci” which also boasts it’s own private pool. Our accommodations were in a two-bedroom two-bath villa, “Terrazza” with a large terrace. While the other accommodations at Villa La Selva especially those offered by Sergio were in good condition, “Terrazza” was very much in need of renovations, especially the bathrooms and kitchen. While this was a disappointment to us, we didn’t let it affect our Tuscan experience. When we arrived at Terrazza, by prior arrangement our hostess, Sherry Carpini, had arranged for a cook to prepare our first meal in Tuscany. What a treat this was! We enjoyed an absolutely delicious dinner, prepared in the Tuscan country style, by Maria, a lovely young lady who’s English was limited to only a few words. Never mind, it didn’t affect her excellent culinary skills or our ability to enjoy what she prepared. Accompanying our meal was a local Chianti in plain unlabeled bottles that had been provided by our host Riccardo. It was from a local vineyard that does not sell commercially and you bring your own bottles to be refilled. While touching on local wines, Riccardo’s brother Sergio operates the vineyards and winemaking at La Selva along with his superb winemaker Stefano Chiocciali. Among the excellent wines they produce are “Selvamaggio IGT” a very deep and powerful Cabernet Sauvignon and “Felciaia IGT” another full-bodied yet soft red that has been described as “Tuscany in a glass”. Although the pleasures of dining are a significant draw to the Tuscany region, the people, the history, architecture and natural beauty thoroughly round out the experience. Each day we ventured out to visit a different town or special attraction. We began the week by attending church in the small town of Montebenichi. While there we were treated to a tour of the hotel “Castelletto Di Montebenichi” and discovered a very fine little restaurant “L’Oreciaia”. The hotel is a non-smoking four-star hotel with only nine rooms. It has most of the amenities of a large city hotel situated in an ancient town of only a few hundred people. It sits high over the olive groves and vineyards of what is considered “Chianti Classico”. The hotel has been fully renovated and features large double rooms for $230 to $280 per day including a buffet breakfast and drinks from the in room mini-bar and at the “bar corner”. Drinks poolside are extra. The restaurant, “L’Oreciaia” is not part of the hotel and sits adjacent to the hotel and church, across the town square. It is very small and reservations are definitely a must. The food and service are excellent in a warm and cozy atmosphere. The name means the place where olive oil is stored in terracotta jars. The winding roads of the Chianti region pass through many old and charming towns and by many wineries, castles and pottery shops. Most of the latter offer tours and the wineries often have tasting. Many also produce and offer olive oil for sale as well. One of the towns that we found quite charming was the hill town of Radda. Along with much of Tuscany, Radda was strongly influenced during the 13th century by the Medici family. It is situated on a hill that separates the Pesa valley from the Arbia valley. In the 1400’s it was made into a Florentine fortress and became the major town in the Chianti region. The ruins of the ancient defensive walls and lookout towers are all that remain of the fortress. Driving east and then south from Radda it is a very short distance to Gaiole in Chianti. This town, surrounded by large estates was an important agricultural marketplace during the middle ages. The many castles in the area evidence the prosperity of the region. By far the most impressive of these is the “Castello Di Brolio”, which is just five miles south of Gaiole. This 12th century castle underwent major reconstruction during the last century and has been well maintained to the present day. There is a nominal admission to tour the grounds. The self-guided tour is worthwhile affording a commanding view of the countryside from the walkway atop the massive walls. It is part of a 2000 acres wine making estate. Interestingly for those who would like a country holiday, two very large fully restored apartments in the Castle and nine others elsewhere on the grounds of the estate, are offered for rent on a weekly basis. The rental depends on the season and the apartment selected and ranges from $1,300 to $4,000 per week. Our most memorial dining experiences in Tuscany took place adjacent to the Castello Di Brolio at “Osteria Del Brolio”. The owner-chef, Seamus de Pentheny O’Kelly is an absolute delight. He not only overseas the restaurant operation, but also prepares and serves each person’s main course. He also operates on the premises a “Tuscan” cooking school on Tuesdays and Fridays from 10AM until 12:30PM for groups from 5 to 20. The cost is approximately $70 per person and includes the course, lunch, all beverages and Chef O’Kelly’s recipes. We didn’t take the course because of time constraints, but did choose “Osteria Del Castello” as the place for our last Tuscan dinner before departing. It was a wonderful and fitting way to end our Tuscan holiday. The next day, we drove to Florence and from there we traveled to Paris and then Boston via Air France. Florence was another wonderful experience as was Assisi. To assist you in planning your Tuscan holiday, we are including some helpful information and further details. Italy is part of the EU and is now using the Euro as its currency. At press time the exchange was 1.05 Euro to the dollar. The best exchange rates are obtained by using your ATM card. ATM Cards - Machines are available in all large cities and towns and in most small villages. Also, the Motorway service areas have ATM’S. Plus and Cirrus are almost always accessible so check to see if your card is supported by one or both. Credit Cards - Most businesses accept credit cards except for the small shops and some shops in small towns. Visa and MasterCard are accepted at all establishments that accept credit cards. When making large purchases, it is best to use a credit card to gain the best exchange rate and also to provide proof of purchase when applying for your VAT refund and the end of your trip. Telephones - When dialing an Italian telephone from the United States, you must first dial the international code of 011, then the country code for Italy of 39, then the city or region code say for Siena 0577, then the six digit telephone number. If you are in Italy, you only dial the region or city code if you are not in that region. For example if you are in the Siena region making a call to a restaurant in the same region you only dial the six digit number omitting the city/region code. When looking at addresses for restaurants and accommodations, it is important to understand that the address will have the name of the region as well as the name of the town. The region name is often the same as the largest city in the region, such as Florence or Siena. The postal code in our addresses precedes the name of the town and the region precedes Italy. Also the number of the street address follows the name of the street. This lovely castle books through several web sites and does not list a telephone for booking. There is no street address because this is a very small town. Again, we caution that in all cases with these restaurants the region name is not the town that the restaurant is located in. No email or web address, but if you are booking room reservations at Castelletto Di Montebenichi, they will make dinner reservations for you. Many of the wines listed are available in wine shops throughout the United States. One of our sources for good wines in the region was Paul Mann, Wine World, Troy, MI. They are importers and distributors of fine wines.